Bayside Mazda | Get the 2018 Mazda MX-5 Today! 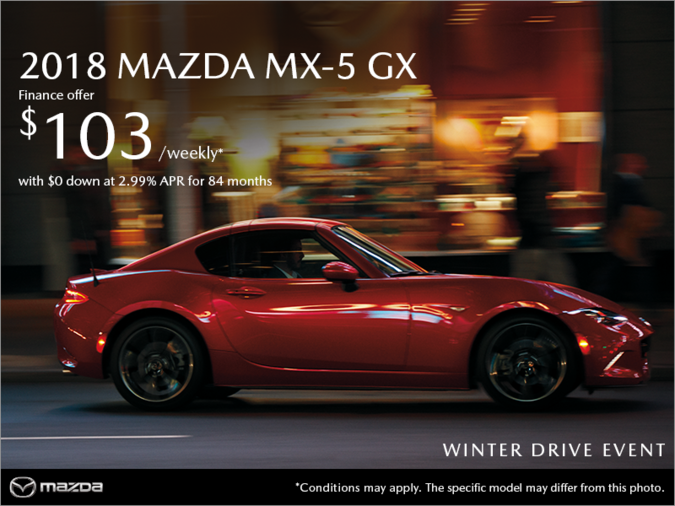 Finance the 2018 Mazda MX-5 GX starting from $103 weekly at 2.99% APR for 84 months with $0 down! ▲0%APR Purchase Financing is available on select new 2018 Mazda models. Excluded on 2018 MX-5 ST/MX-5 RF and all 2019 models. Based on a representative agreement using an offered pricing of $17,695 for the new 2018 Mazda3 GX (D4XK68AA00) with a financed amount of $18,000, the cost of borrowing for a 72-month term is $0, monthly payment is $250, total finance obligation is $18,000. Offer includes freight and P.D.E. of $1,695. Offer excludes PST/GST/HST. ▼i-Activ AWD Credit offer (value up to $1,000) is available to qualifying retail customers who cash purchase/finance/lease a select new, in-stock 2018 and 2019 Mazda model from an authorized Mazda dealer in the Atlantic Region between February 1-28, 2019. Amounts vary by model: $300 on all 2018 Mazda3/Mazda3 Sport, on all 2018 Mazda6, on all 2019 CX-3 and on all 2018 & 2019 CX-5 models. $475 on 2019 MX-5 ST GS models. $750 on all 2018 MX-5 ST/MX-5 RF, on 2019 MX-5 ST GS-P & GT, on all 2019 MX-5 RF models. Maximum $1,000 on all 2018 & 2019 CX-9 models. i-Activ AWD Credit applied before taxes. i-Activ AWD Credit offer cannot be combined with Winter Tire Credit Offer. NOTE: i-Activ AWD Credit offer not available on 2019 Mazda3 models. Some conditions apply. See dealer for complete details. Winter Tire Credit offer (value up to $1,000) is available to qualifying retail customers who cash purchase/finance/lease a select new, in-stock 2018 and 2019 Mazda model from an authorized Mazda dealer in the Atlantic Region between February 1-28, 2019. Customer can substitute a cash discount of up to $1,000. Amounts vary by model: $300 on all 2018 Mazda3/Mazda3 Sport, on all 2018 Mazda6, on all 2019 CX-3 and on all 2018 & 2019 CX-5 models. $475 on 2019 MX-5 ST GS models. $750 on all 2018 MX-5 ST/MX-5 RF, on 2019 MX-5 ST GS-P & GT, on all 2019 MX-5 RF models. Maximum $1,000 on all 2018 & 2019 CX-9 models. Cash discount substitute applied before taxes. Wheels and installation extra. Winter Tire Credit offer cannot be combined with i-Activ AWD Credit Offer. NOTE: Winter Tire Credit offer not available on 2019 Mazda3 models. Some conditions apply. See dealer for complete details. ‡Offer available on retail leases of new 2019 CX-3 GX (HVXK89AA01)/2019 CX-9 GS (QVSM89AA00) with a lease APR of 2.49%/1.95% and 130/130 bi-weekly payments of $141/$199 for 60/60 months, the total lease obligation is $18,285/$28,253, including down payment (or equivalent trade-in) of $0/$2,375. As shown, Offered Pricing for new 2019 CX-3 GT (HXTK89AA01)/2019 CX-9 GT (QXTM89AA00) with a lease APR of 2.49%/1.95% and 130/130 bi-weekly payments of $195/$255 for 60/60 months, the total lease obligation is $25,388/$35,502, including down payment (or equivalent trade-in) of $0/$2,375. NOTE: 2019 CX-3 lease offers include $1,000 lease cash. Lease payments include $150 Lease Dealer Service Fee (all models), $100 Air Conditioning charge (where applicable), freight and P.D.E. of $1,895/$1,895. 20,000 km per year mileage allowance applies; if exceeded, additional 8¢ per km applies (12¢ per km for CX-9 models). Offers exclude PST/GST/HST. Offered leasing available to retail customers only. ‡‡Finance Pricing for new 2018 Mazda3 GX (D4XK68AA00)/2018 Mazda3 Sport GX (D5XK68AA00)/2018 CX-5 GX (NVXK68AA00)/2018 Mazda6 GS 6AT (G4SN88AA01)/2018 MX-5 GX (L2XK68AA00) is $17,445/$21,445/$27,895/$29,145/$33,795 financed at 1.49%/1.49%/2.75%/1.49%/2.99% over 84/84/84/84/84 months equals weekly payments of $49/$62/$84/$84/$103 with $349/$0/$0/$0/$0 down payment, cost of borrowing is $918/$1,151/$2,803/$1,564/$3,702 with a total obligation of $18,363/$22,596/$30,698/$30,709/$37,497. As shown, 2018 Mazda3 GT 6AT (D4TL88AA00)/2018 Mazda3 Sport GT (D5TL68AA00)/2018 CX-5 GT (NXTN88AA00)/2018 Mazda6 GT (G4TM88AA01)/2018 MX-5 GT (L2TK68AA00) $25,370/$26,370/$37,095/$37,945/$41,195, financed at 1.49%/1.49%/2.75%/1.49%/2.99% over 84/84/84/84/84 months equals weekly payments of $72/$76/$112/$110/$125 with $349/$0/$0/$0/$0 down payment, cost of borrowing is $1,343/$1,415/$3,727/$2,037/$4,512 with a total obligation of $26,713/$27,785/$40,822/$39,982/$45,707. NOTE: 2018 Mazda3 GX and 2018 Mazda3 Sport GX finance offers include $250 finance cash, 2018 Mazda3 GS and 2018 Mazda3 Sport GS finance offers include $350 finance cash, 2018 Mazda3 GT and 2018 Mazda3 Sport GT finance offers include $525 finance cash. Finance payments include $100 Air Conditioning charge (where applicable), freight and P.D.E. of $1,695/$1,695/$1,895/$1,795/$1,795. First monthly payment is due at finance inception. Offers exclude PST/GST/HST. Licence, insurance, taxes and down payment (where applicable) are extra and may be required at the time of purchase. Dealer may sell/lease for less. Dealer order/trade may be necessary on certain vehicles. Offers valid February 1-28, 2019, while supplies last. Lease and finance on approved credit for qualified customers only. Offers subject to change without notice. Visit mazda.ca or see your dealer for complete details.